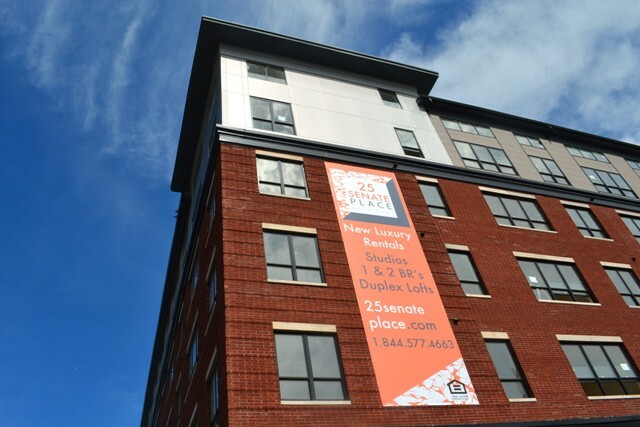 JERSEY CITY, N.J. – In what is the latest sign of the neighborhood’s transformation into an active and vibrant residential and arts destination, 25 Senate Place has opened across the street from MANA Contemporary in Jersey City’s burgeoning Journal Square Arts District. Featuring 265 uniquely-designed rental residences, upscale amenities and a soon-to-open Modcup roastery and café, 25 Senate Place delivers a modern living experience to the neighborhood’s mosaic of repurposed warehouses and growing arts scene. Initial occupancy is slated for November, 2015. The fulcrum of the neighborhood’s cultural transformation was the opening of MANA Contemporary, the 2 million square-foot art center featuring more than 10 exhibition spaces, a theater, dance studio, foundry, silkscreen studio, and 150 artist studios, as well as the Richard Meier Model Museum and other renowned tenants. Art House Productions, an active visual and performing arts organization, is located in Journal Square, as is the revitalizing Landmark Loew’s Jersey Theatre and award-winning Hudson County Community College Culinary Arts Institute (CAI). A more traditional locational advantage is the Journal Square Transportation Center with convenient PATH service to downtown and midtown Manhattan and Newark Penn Station. Residents will also appreciate having one of the region’s most celebrated independent coffee providers at their doorstep as Modcup, which roasts green coffee beans from around the world, will open a café and roastery in one of the building’s street-level retail spaces. For canine lovers, Club Barks Doggy Day Care will also set up shop onsite.